When you first think about it, cruise vacations seem to be perfect for scooter and wheelchair users. Once you get on board you have accessible areas close to hand with activities, entertainment and meals along with attentive staff just steps away. Even with this in mind, you still have to do a bit of extra planning BEFORE you book your cruise if you are going to be using a wheelchair or scooter onboard. Below are some typical problems you can expect on a cruise vacation and how you can easily fix them. Wheelchair accessible staterooms are different from ship to ship as well as the quality and availability. Never assume that an accessible stateroom will meet you accessibility requirements. Will your scooter or wheelchair fit into the room? Can you easily maneuver in the bathroom? Is there an electrical outlet near the bed so you can easily recharge your scooter? Do not book your cruise unless you are 100% confident that the stateroom meets your requirements. Solution: Talk to an accessible travel agent or to the actual cruise line and discuss your special requirements. Be sure to ask for EXACTLY what you want. Getting aboard your cruise ship is straightforward when you get on at a cruise dock with level entry and elevators. The same isn't true for locations where tenders or gangways have to be utilized. Actually, many cruise lines do not permit wheelchair individuals who are not able to climb up and down steps to depart the ship by way of a tender. Others enforce major limits on the usage of tenders. Gangways are also troublesome, since they are tight and ridged and given that they occasionally have to be positioned at really sharp angles. It is vital to go through every single one of the stipulations for your cruise line to determine what tendering guidelines apply to your particular cruise ship. Solution: Select locations that have cruise piers, then call your cruise line to ensure that you can disembark at any of the ports. Expect to be adaptable just in case port calls have to be altered after your cruise starts. Certain cruise lines enforce wheelchair and scooter weight limitations or will not allow travellers to take electric powered scooters or wheelchairs aboard. Some limit wheelchair and scooter widths so as to avoid issues with small doorways. And some, especially European river cruise lines, will not allow wheelchairs or scooters to begin with. You can even face the chance of damage to your wheelchair on your journey. Solution: Just as before, go through each of your cruise line's stipulations prior to booking. Understand which kinds of wheelchairs and scooters are allowed. If yours cannot satisfy your cruise line's conditions, look into renting a compact version during your cruise. Carry a short list of wheelchair or scooter service shops with you; the ship's staff might assist with a modest, basic repair. 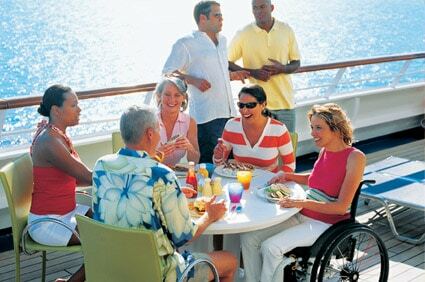 Most cruise lines strive to offer accessible staterooms, events and shore trips. Investigate a bit or find a tour operator who knows about accessible travel matters, find answers to all your queries and select your cruise.